Isn't it time you considered RAW? RAW or JPEG - what's the difference? A RAW image is the image that comes directly (after a construction process) from your camera's sensor. All digital cameras provide you with a JPEG (or JPG) image. But not all digital cameras allow you to access the RAW image. JPEG images are highly processed RAW images. That processing occurs in your camera. Unfortunately, that "in-camera processing" destroys most of your image data! All DSLR (Digital Single Lens Reflex) cameras (to my knowledge) do provide the RAW image. But not all point-and-shoot cameras do - you'll have to check your manual (or CheatSheet) to see if it does. A lot of people are afraid to shoot in RAW mode, mainly because they don't understand it. Shooting RAW is actually EASIER than shooting JPEG because you don't have to worry about as many camera settings. If you shoot raw, you will need to do some work after shooting. RAW images do need to be computer-edited. This is also a LOT easier than you think. Many post-processing programs like Photoshop, Elements, Lightroom, etc., are designed to be quite easy. Often, it doesn't take much more than one or two keystrokes! Every post-processing program that I've ever seen has an "auto" feature. This is similar to what the camera does, but these programs do the post processing MUCH better than ANY camera can. Shooting JPEG or RAW is like eating hamburger or steak! Just as hamburger is sometimes preferred to steak, JPEG images can have their place. It's not a matter of ONLY shooting RAW, but, if you understand both, you'll have a better sense which is better for you, and WHY and WHEN. Unfortunately, some "Point and Shoot" cameras don't provide the option to shoot RAW images, but all DSLRs and most high-end point and shoot cameras do. And the difference between the two is VERY substantial. And, contrary to some beliefs, shooting RAW, and the accompanying post-processing can be REALLY EASY! I rarely spend more than 30 seconds per image for post-processing my RAW images - and that 30 seconds can make all the difference in the world in my images - and it will in yours as well. Best of all, you can shoot BOTH and get the best of both worlds! Most cameras that shoot RAW allow you to shoot BOTH at the same time. This means that every time you press the shutter to take a picture, TWO images are saved: the RAW image and the JPEG image that was processed by the camera. If you like the JPEG image, there's nothing to do. But, if the JPEG doesn't look quite right to you (i.e., too dark or light, the colors are "off", etc. 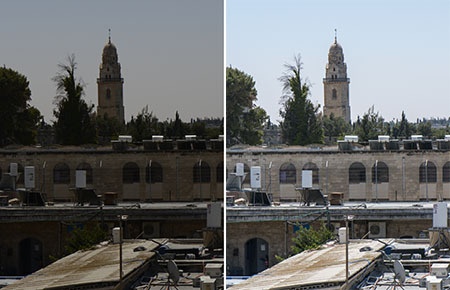 ), you can then post-process the RAW image to get a better image. What about editing JPEG images? You can computer-edit JPEG images, BUT... JPEG images have already been stripped of MOST of the data in them. This reduction to 8-bits, removes MOST of the data in a RAW file – the effect of this is mostly seen in the shadow and highlight areas – and it also reduces the ability to successfully edit the file. JPEG files are about one-sixth the size of RAW files! That’s a LOT of missing data. 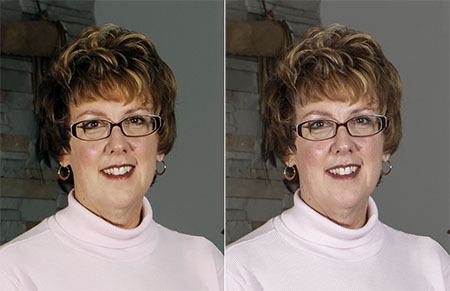 Here's a comparison of a computer-processed JPEG image (on the left) and the same computer-processed RAW image (on the right). Look at the detail in the hair and skin tones - the loss of detail in the JPEG images is because of the differences in the above table. you can see that it doesn't look as good as the RAW processed image, especially in the shadow areas of the hair and in the skin tones. When JPEG images are created, they are "compressed". JPEG uses a "lossy" compression to reduce image file sizes. This compression also reduces quality. Consider the following 3 levels of compression and you can see how this "loss" manifests itself. At 50% compression, there is some degradation – at 100% it’s pretty severe. Most digital cameras allow you to set the “Quality” of your JPEG images – using titles like "Fine", "Normal" and "Basic" to describe the amount of compression. 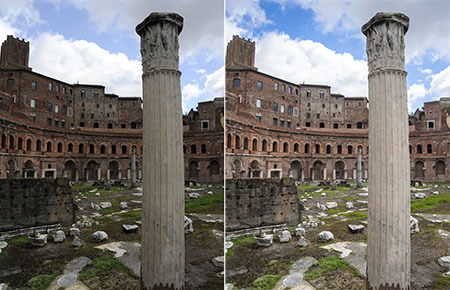 "Compression" only affects JPEG images - there's no loss with RAW images. The amount of "loss" from this compression, also affects your ability to post-process JPEG images. We ALWAYS shoot both RAW and JPEG and use the JPEG images for "proofing". We go thru our images and select which JPEGs have the most promise. We look for images that are sharp and have good composition, not worrying about if they're too light or dark, or if the colors are correct, as these are things that are EASILY corrected with the RAW image. We then copy all of the RAW images that we like to a single folder and computer-edit these images. Once edited, we save the image as a JPEG, which can then be emailed or posted to a web site. Computer processing of the RAW image fixed this easily. In this image, the camera got the white balance ALL WRONG. and color in the foreground, without losing too much detail in the sky. Although the JPEG image isn't bad, you can see how much better the RAW image is. If your camera is capable of providing you with a RAW image, then you should seriously consider setting your camera to take both RAW and JPEG images simultaneously. Whether or not you choose to shoot RAW images depends on how you use your images and what you expect in your images. Chances are, you've recently purchased a more expensive camera so you can get better images. Maybe what you really need to do is to consider shooting RAW. The ProDot Shutter Button Upgrade We find the ProDot to be one of the best, and least expensive, accessories we own..